Priced at $2,495,000 this three bedroom apartment in Horizon, a testament to quality and design, guaranteed to deliver luxury and sophistication. The northerly aspect of this apartment and 2.7m high stud height allows for vast amounts of natural light and fresh air to flow effortlessly through, whilst at the same time offering a sense of peace, tranquillity and privacy. Floor to ceiling windows in the open-plan living and kitchen area open flush with spacious 21 sqm balcony, providing seamless integration between the indoors and out and offering pleasant views to the north. Your bespoke kitchen features Miele and Liebherr appliances, an Italian porcelain benchtop, plenty of storage and its large island creates the perfect hub for entertaining guests. Horizon's interiors feature contemporary fixtures and fittings blending classic design with a modern decor scheme. Each owner is provided a variety of finishes to select from, allowing the opportunity to personalise their space. All three bedrooms have wardrobes with double sliding doors with a mirror panel and high quality 100% NZ wool carpet on the floor. Both bathrooms feature floor to ceiling porcelain tiles with underfloor heating on temperature control, fully tiled shower and European designed tapware. 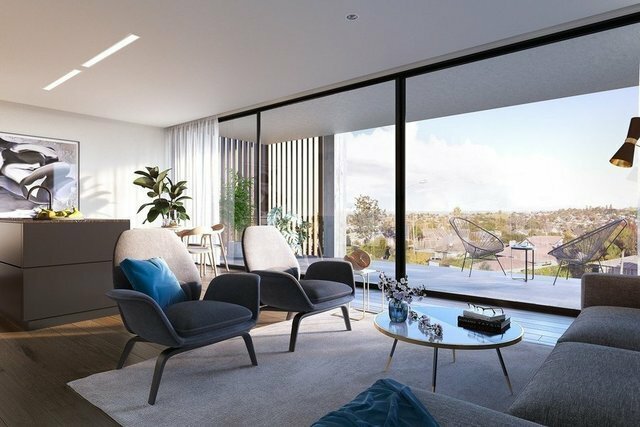 Designed by the Buchan Group and conceptualised by the award-winning Auckland developer Reside, Horizon Mission Bay offers a lifestyle truly special. Apartment 104 comes with two car parks and separate storage unit. The development is pet friendly. Visit thehorizon.co.nz for more information. Please note: images are architectural renders only.